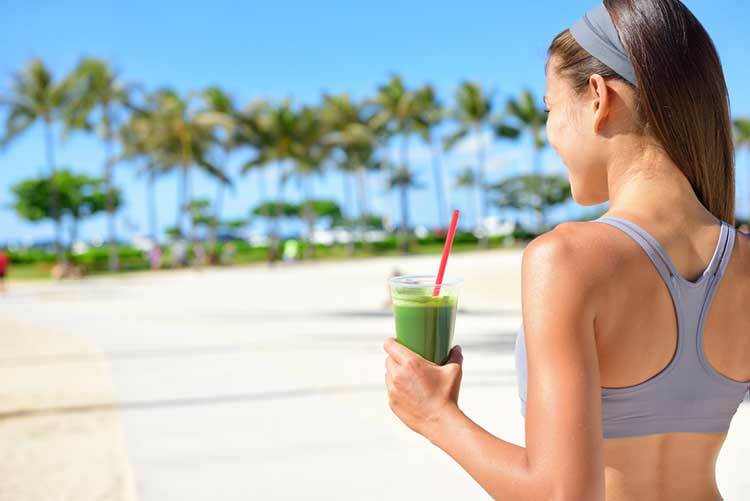 Juice cleansing is a fast and efficient way to lose weight and rid your body of toxins. But there are so many to choose from! 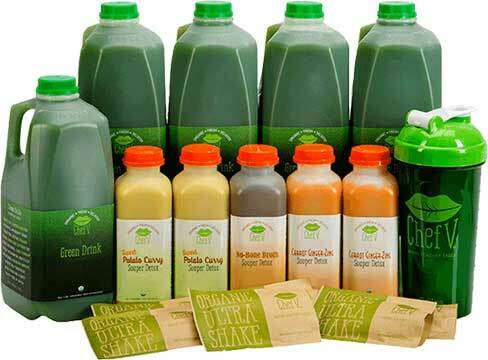 It seems that more and more juice cleanse delivery companies are popping and it can be hard to know which one is best. I’ve found and reviewed all the best juice cleanses whether you’re looking to lose weight, detox and give you younger looking skin. But first I want to take you through a few things you might want to consider before committing to your juice cleanse. Of course, please talk to your doctor first and don’t do yourself any harm through a juice cleanse, be sensible! This is probably the main question you want to ask yourself before you start your juice cleanse because it will change how much juice you buy. The typical lengths are 1-day, 2-day 3-day, 5-day and 7-day and they’re each good for different things. 7-day Juice Cleanse – is best if you’re looking to kick start a healthy living transformation, people have lost up to 20 lbs on a 7-day cleanse so it’s also the best for losing weight. It’s not the easiest of course because it’s the longest but well worth it if you’re looking for life-changing results. 5-day Juice Cleanse – not as extreme as the 7 day making it a little easier while still letting you lose a lot of weight,ideal if you’re looking for a complete detox. 3-day Juice Cleanses – are good to do regularly, every 2-3 months you do a 3 day cleanse to really reset yourself, they’re also good if you want to quickly slim down before a holiday or an event that’s coming up. They’re also perfect for beginners. 2-day cleanses – are perfect to do over a weekend when you’re not going to be stressed out at work and you don’t have any big commitments so you can relax, detox and start again fresh on Monday. 1-day Cleanse – you can do once a month or even once a week, much easier to commit to and you feel really great afterwards. Ideal for recovering from a night of partying. I’ve got a whole guide on juice cleansing that you might want to consider checking out for all in the info but stay here for the quick version. Basically you want to start making healthier changes before you start, this will make it easiest to transition into and ensure you get the most from it. If you already live an active healthy eating lifestyle then you can probably jump straight in but if you’re looking to lose weight then you’ll need to make some changes. Avoid junk food, soda, instant foods, takeaways and anything you know is unhealthy. Also, start drinking less coffee, and no alcohol if possible. Instead start having salads, soups, homemade meals, nuts, lots of vegetables and consider making the swap from dairy milk to nut milk as they are not only lower calorie but easier on the digestion. Plus make sure you’re staying hydrated. If that all seems too much then just try and minimise sugar, that’s going to make the real difference. Do I Need To Buy Locally? If you can that’s great, places like NYC and LA have lots of juice bars that offer juice cleanses but for the rest of America who might not have that option don’t worry. You can buy juices cleanses online and those are going to be the one I talk about here. Some of the benefits you might get during and after your juice cleanse. It’s the one we’re all hoping for right? Well, you might have heard that after a juice cleanse you put all the weight back on again but that’s not completely true. Some of the weight lost during a juice cleanse is water weight but it’s also fat that you’ve burned from having fewer calories than normal. And often people carry a lot of excess water, especially if you’re overweight so once that’s gone some of it will come back (your body needs to store water) but not all of it. So the weight you lose is real weight loss and as long as you keep up a healthy lifestyle after you finish your cleanse it will stay lost. But the great thing is that because you’re getting so much nutrition you don’t feel as sluggish or tired as you would just cutting out calories from your diet normally. You get packed full of vitamins and nutrition which leaves you feeling energised and invigorated while losing weight. A juice cleanse is a form of fasting, and while your fasting some really cool things happen inside the body. One of them is that your organs actually shrink down to conserve energy and when that happens they get rid of all the bad cells to help them shrink down and keeps all the good cells, then when you’re filling yourself with lots of nutrition you can replace the bad cells with new healthy ones. Plus there’s all the pollution around us all the time and if you drink from plastic bottles bits of that plastic end up inside of you and need to be purified by the liver which is working overtime so giving it a chance to relax and catch up can only be a good thing. So all in all your body can fully detox itself leaving you feeling fresh and reinvigorated. Juices are full of vitamins as I’m sure you know but these vitamins all work to give you healthier younger looking skin.Vitamin A works to grow new skin cells that can replace the old ones. Meanwhile Vitamin E works to protect against free radicals that are a type of molecule that’s all around you that can damage and destroy skin cells. And finally you have Vitamin C which works to protect your skin from UV damage which is ideal for summer or if you live in any of the sunny states our great country has. Time for the main event, the review of the Best Juice Cleanses available here in the United States. 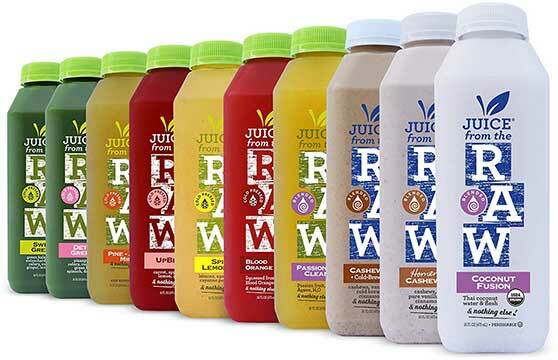 The criteria for making the list was that the juices MUST be cold pressed, suitable for vegans and vegetarians, be delicious, have no added sugar and be available over the whole of the USA. All the juices I found were so you can be assured you’ll be getting a quality product. 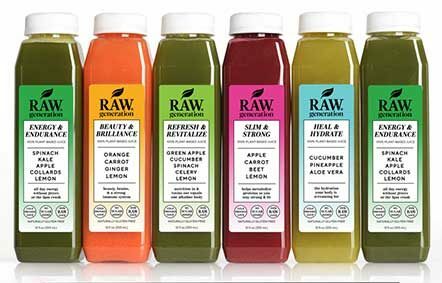 Raw generation juices are cold pressed and flash frozen to lock in all the possible nutrients which is better than regular freezing because it stops any nutrient loss. They get delivered in a cool bag and you just pop them in the freezer where they can last for 7 days. They’re delivered nationwide with free shipping and can be delivered to your home or office which is handy. But the best thing is the 5 delicious flavours you get. I’ll let you click through the above button to the website to get the specifics of each flavor, but what I’ll tell you is they’re sweet without being high in sugar and one of the tastiest juices available. It’s 6 bottles of juice a day which is plenty to stagger out so you don’t feel hungry and the 7-day cleanse will help you lose weight in no time. Click here to read my full Raw Generation review or go to their website and order yours. Based in LA the Chef V cleanse is perfect for beginners who are looking to do their first cleanse but aren’t sure about it. Because you get 4 big green juices as well as 2 protein shakes and 1 detox vegetable soup. On top of that you get access to some recipes to start with before and after the cleanse. The soup adds a nice hot meal at the end of the day which can help bring some normality to the process and the protein shakes help give you extra energy if you are quite an active person. Free shipping in LA, Orange County, San Diego, NYC and North Jersey but they do deliver all across the United States. One thing compared to the raw generation these only last for 7 days after you buy them but they’re never frozen and don’t get pressured during their packaging. The perfect cleanse for beginners. Click here to read my full Chef V review or go to their website and order yours. Suja juice have a great 3-day cleanse that offers an organic and low calories approach to juicing. It includes 7 juices for the day including one probiotic lemon water, and one protein juice to keep you fuelled. Plus, they recommend and give you a recipe for overnight oats to have as a healthy breakfast which is low calorie but really helps because you’re still eating something every day. It’s a front-loaded approach to calories so you have your calories in the morning (still not many) to see you through the day and your juices to help keep you topped up. A really great juice cleanse, the 3-days will pass in no time at all and you’ll come out the other end slimmer and happier. I don’t mean you get lunch delivered but it’s a 5 day cleanse that allows for one salad per day which brings a bit of normality because you’re still getting to eat a solid meal. Apart from that you get to have four juices per day and they’re all very tasty, they arrive frozen and go straight in the freezer where you can keep them for again up to 6 months. Once they arrive you just defrost them for the next day and you’re ready to get started. 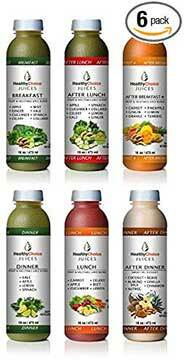 You also get 10 different flavors to enjoy over the 5 days and a recommended order to have them in so you get a lot of variety which is nice when it’s a longer cleanse you’re doing. A great one for losing weight. I was unsure about including this one because they use a process called HPP to pack their juices which is High Pressure Process. It keeps the juice fresh so it lasts up to 60 days from being processed but the downside is that it kills off any of the live enzymes and can reduce the nutritional value compared to fresh juice. But, it’s a 1 day cleanse which not many people offer so I thought I’d include it anyway. You get 6 different flavours to enjoy throughout the day so you’re never going long periods without anything and they taste pretty darn good. Your alternative is to but the Raw Generation 3-day cleanse and use them as 3 1-day cleanses and because they last 6 months it’s still an efficient way to do it. And there you have it! Everything you need to know about buying a juice cleanse, I hope you found one you like the sound of, if you give one a try come back and share how you got on in the comments!